My good friend Kristina has been busy planning her oldest daughter, Annikka's wedding. We started talking about decorations and that led to me acquiring this dresser. The plan was to fancy her up a bit, use it for decoration for the reception and then give it to Annikka for her new apartment. This is my version of a wedding gift. Notice the cobwebs underneath? Yeah, she'd been stored on a back patio for quite a while. So, cutting to the chase. I primed, brushed 2 coats of homemade chalk paint, added some off-white accents and here she is. Since she had some pretty significant wear, I decided we should rock the shabby look, made possible with some 100 grit sandpaper and a whole lot of elbow grease. When it came time to seal it, I chose not to go with my typical PAS. 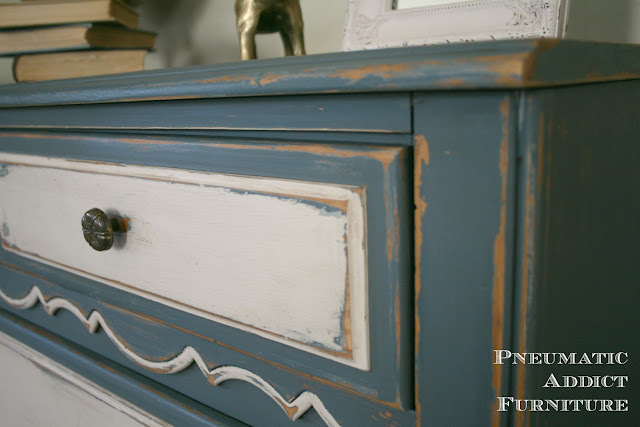 I knew I wanted some sort of glaze or dark wax to bring out the details and since I used chalk paint, if I used polyacrylic that would mean brushing on at least one coat to seal the porous paint, glazing, and then brushing on 2-3 more coats. That didn't sound too fun. I decided to bring out the detail with some dark antiquing wax. 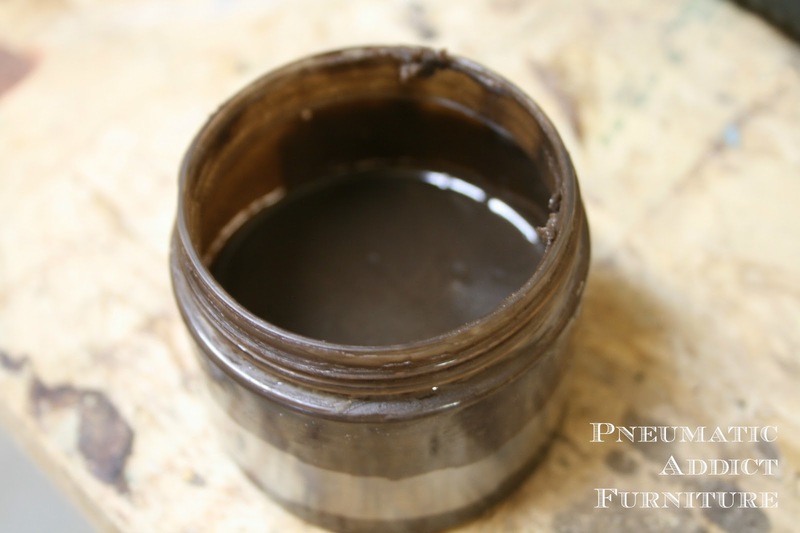 Since I made my own chalk paint, why not make my own dark wax too? I started with some Johnson Paste Wax. Why? Because I had it on hand. Why did I have it on hand? Because it's half the price of most soft waxes and I'm cheap. I've used both Annie Sloan and CeCe Caldwell wax before. I like them both (CeCe Caldwell's better), but I've had really good results with SC Johnson's paste wax too. To get ready to tint the wax, make sure the wax is very soft, almost melted consistancy. To do this, you could set the tub in a bowl of hot water, not reaching the top of the tub and let it sit for a few minutes and then stir well. Or, you could do what I did and leave the tub of wax sitting on a shelf in the garage and live in a place that reaches 115 degrees almost daily. That technique worked great! All I had to do was scoop some out into a plastic container. Because wax is oil-based, you will need to tint it with an oil-based product. 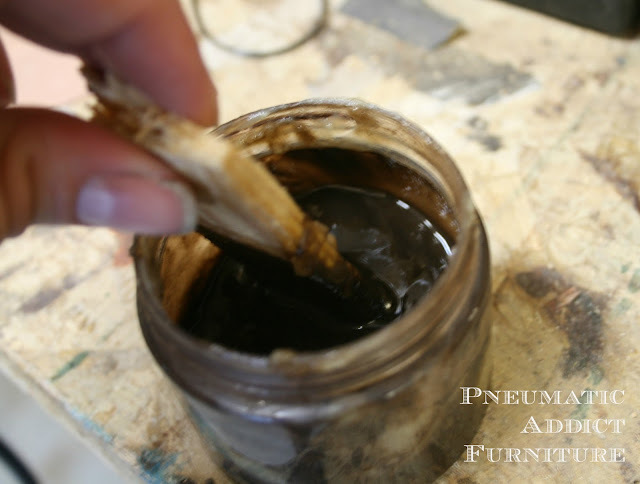 I started by pouring a bit of Kona wood stain into the wax and stirring well. It looked perfect! But when I tried some on a sample board, it was a bit weak. It didn't really leave any color after it was buffed off. So, to step it up a notch, I added around a teaspoon of Raw Umber universal tint. I know I've mentioned this product a million times before, but it's really that useful! You can use it to tint virtually anything (water-based, oil-based, shellac, etc)! 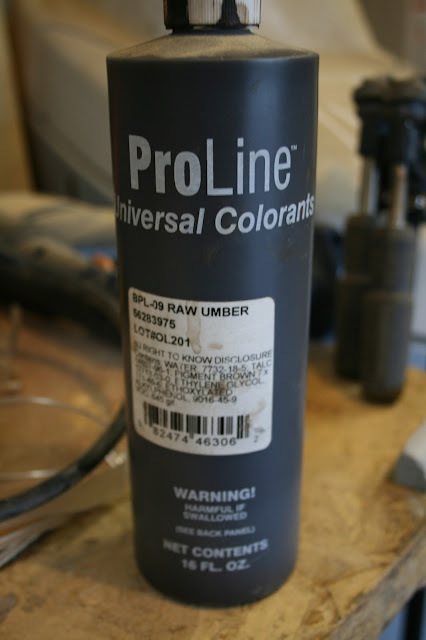 I talked about using universal tint to mix custom glaze in this post. Also, a bottle only costs around $10 at Home Depot and lasts forever. I bought this bottle over a year ago, use it several times a month, and it's more than half-full still! 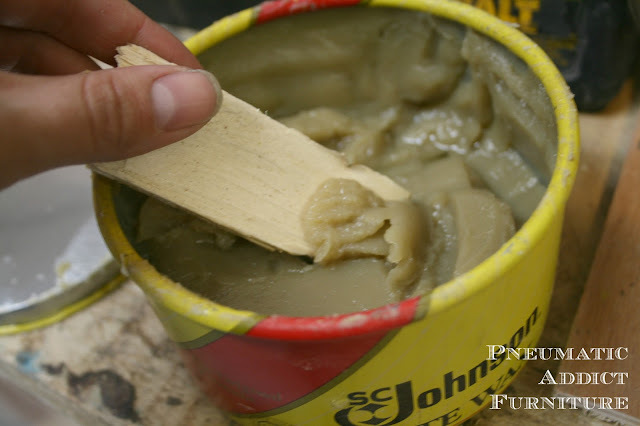 After adding the tint, I stirred the wax very well, making sure to blend any lumps. It was pretty runny. Too thin to try to wax something with. I simply covered the container, and popped it into my fridge for about half an hour. Once it set up, it was perfect! Nice, smooth, dark wax with just the right amount of pigment. Back to the dresser/wedding gift. 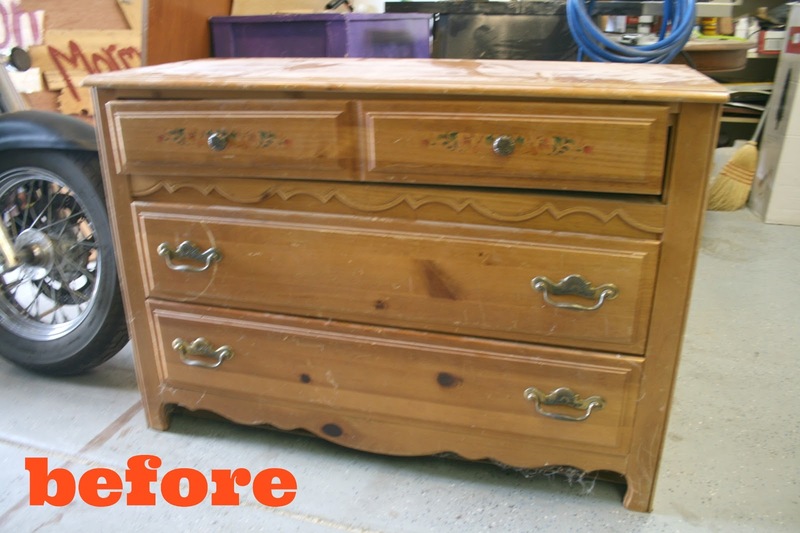 Using a clean rag, I rubbed on one coat of dark wax, let dry and buffed. After about 3 hrs, I applied an additional coat of clear wax, for added protection. The dark wax toned down the white a bit, without making it look dirty. And I love the way it emphasized the details in the wood. I'm happy with the way my blue and white painted dresser came out and I'll definitely make my own DIY dark wax again! 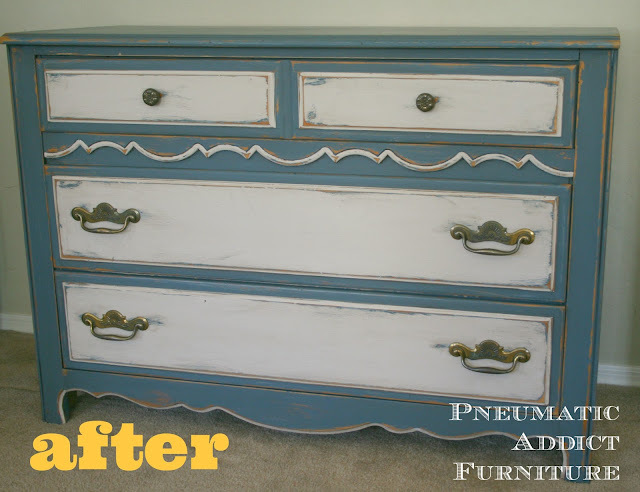 This dresser redo turned out amazing. Putting stain in your wax was a great idea. Love the look! I love the dresser! I am so happy about your dark wax tutorial too! I am pinning! Oh thank you for this tutorial!! I have been wanting to try dark wax for the longest time and now I can! Yep! I CAN do this! I really like that dresser. 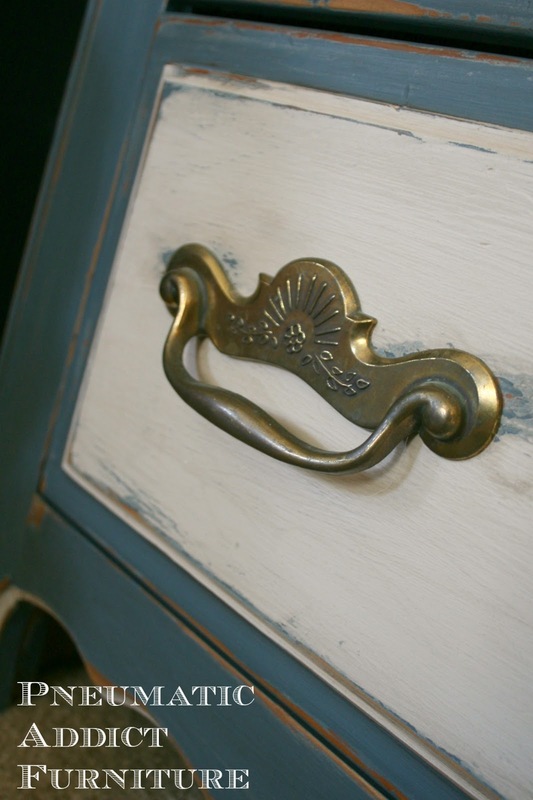 I have using chalk paint and wax on my list. thanks for this post. I am so flipping in love with this! I have a nightstand I am going to do this on THIS weekend. I am telling you now so that it will actually happen ;) This is especially useful because Lowe's only carries clear wax. You are a GENIUS!!! You were my most clicked on link at my PAINT PARTY!! I will be featuring at my next Party that will start wednesday night! Thank you for linking up! I totally love the blue and white combination! 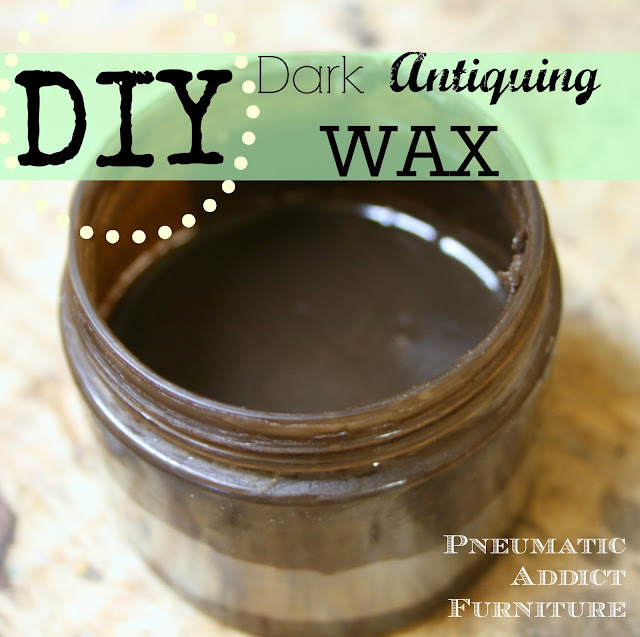 And making your own dark wax - awesome! Beautiful, I would have been thrilled with a wedding gift like this! I'm so happy that you came by to party with us at Fluster Buster's Creative Muster. Now that you found us I hope that you continue to join the party. 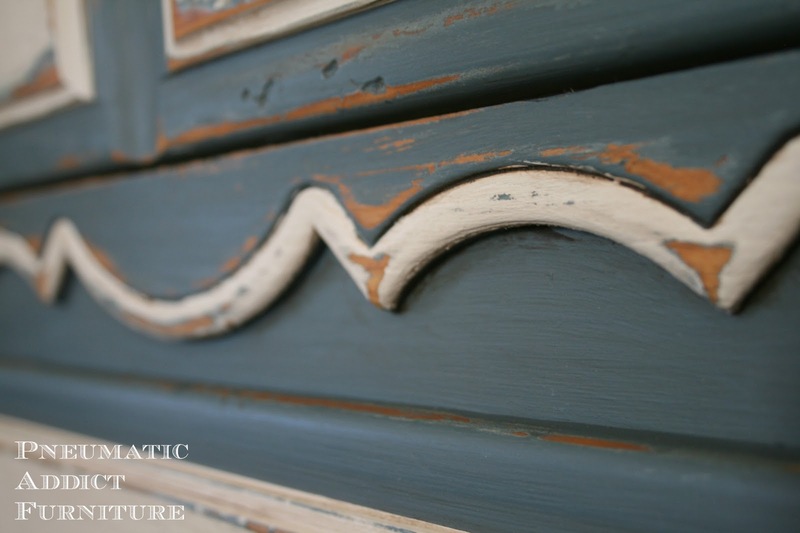 Love the dresser and the DIY dark wax. Totally will try this when I run out of AS dark wax!! Beautiful project! Thanks for the tips on darkening the wax ~ I've been thinking of trying that. I can't believe this -- what a beautiful result and great idea playing up the 'worn' look. Thanks for the info. on the tinted wax -- hope to try this as I've run out of my dark wax now. Very cool - can't wait to try to make my own dark wax too. 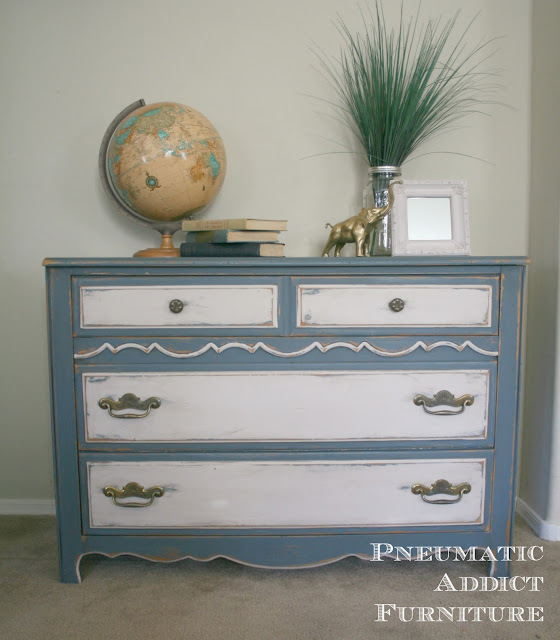 I'm featuring your gorgeous dresser in the PoPP Spotlight this week. Thanks for linking up. Wow. Wow. Wow. This is great. I never would have wanted a piece that looked like that, but you have proved that anything can be made beautiful. Thank you for sharing all the great ideas about darkening the cheap wax, using the tint, etc. I'm pinning these to my Furniture Finishes board. Came to you through Elizabeth & Co. and now I'm going to find a way to sign up to get your blog! Great post. 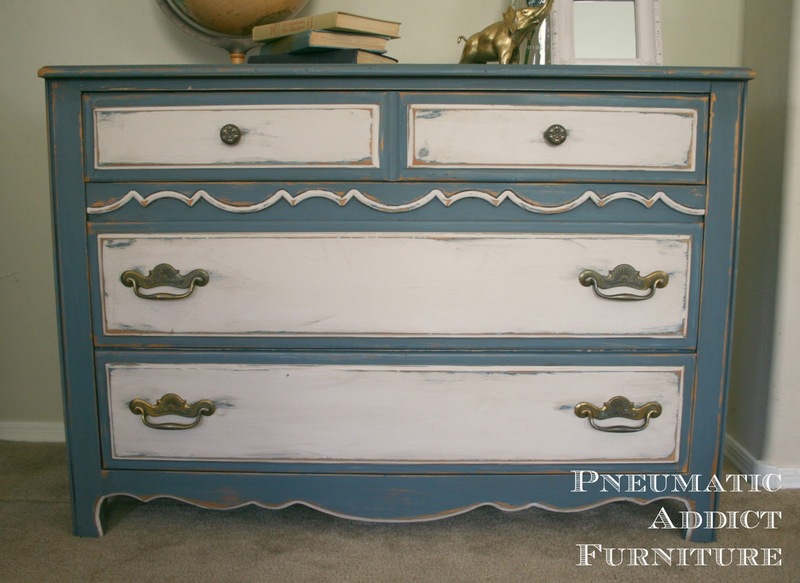 Although I have yet to refinish any furniture I have often wondered if I could do it on the cheap. I have made home made chalk paint but not home made tinted wax. 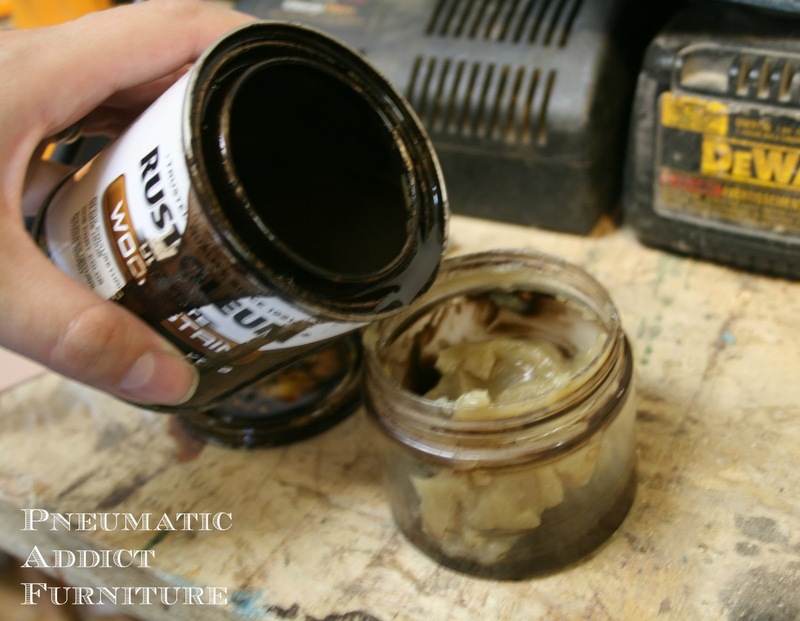 I have used the Johnson's clear wax on my chalk paint pieces with good results so I am so happy to have come across your post (saw it over at the furniture party at Miss Mustard Seed's) on how to make it dark when needed. Thanks so much for sharing your idea. This looks great. And I love that you made your own wax. I always have a variety of paints, stains, and waxes on hand and am going to try to make my own now! I enjoyed meeting you at Haven! Your site and projects are awesome! How great! I've learned so much about waxes the last few days just reading everyone's posts! How does your homemade wax smell, though? Any unpleasant odor? Thanks for bringing another awesome project to Throwback Thursday! I will definitely save this one! I use shoe polish it works great and then bees wax. I love your work! very pretty piece you've done here. 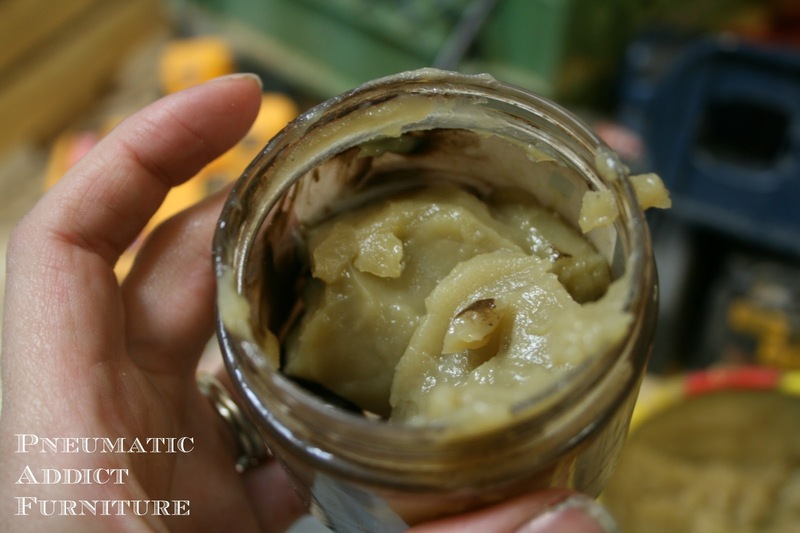 I have linked this post to one of my blog posts about the differences between using wax vs poly (I hope that's ok, if not, please let me know). I may need to try this tinting idea and give wax another try! Awesome I knew that dark stain mixed with regular wax would make dark wax...Thanks for the proof that it really works! I like your blog but the font you use is very hard to read!!! Awesome I knew that dark stain would make a regular clear wax a dark wax! I like you blog but the font you use is very hard to read!!! Tx. Very good article. Have you tried Coconut oil instead of past wax? I'm going to try it. It is much softer. From incredibly ugly to ... Wow! Did you put any sealants over those large knot holes?